Echocardiogram and electrocardiogram sound alike and are often confused, especially since both tests are performed to check the functionality of the heart and to detect cardiac problems. While an echocardiogram is focused on detecting structural problems of the heart, an electrocardiogram is concentrated on the electrical aspect. These two diagnostic tests are different in so many ways and we will discuss them in this article. An echocardiogram (ECG) is an advanced, non-invasive diagnostic test to determine problems in the structure and function of the heart. The blood flow in the heart emits high frequency sound waves so the echocardiogram is able to display a picture of the heart on the screen as it captures the sound waves through ultrasound by the Doppler principle. The sound waves that are produced allow us to see if the heart is pumping normally, if the valves are sufficient, or if there are anatomical defects of the heart. Additionally, an echocardiogram can measure the size and shape of the heart and detect previous heart attacks, infections, or blood clots. The test is performed by a sonographer or ultrasound technologist. If you will undergo an echocardiogram, you will be asked to lie on your side. The sonographer will apply gel on your chest and a transducer will be placed on the area. The image of your heart will then be displayed on the monitor. This will take approximately 30 minutes. An electrocardiogram (EKG) is a simple, non-invasive, and very common diagnostic test to determine rhythm and electrical problems of the heart. The electrical activity of the heart is reflected on the electrocardiogram’s tracing paper. The patter produced shows the heartbeat, regularity of rhythm, problems with the cardiac tissue, thickness of the heart muscle wall. The test is conducted by an EKG technician. If you undergo an electrocardiogram, you will be asked to remove all your jewelry, accessories, belts, or any metal attached to you. You will lie on your back and leads will be attached to your chest, arms, and legs. You should keep still and avoid talking during the procedure. The procedure only takes around 5-10 minutes then the electrocardiogram tracing will be ready for interpretation. Echocardiograms and electrocardiograms are both extremely helpful diagnostic tests to determine cardiac pathology. They are both are non-invasive and easy to perform. 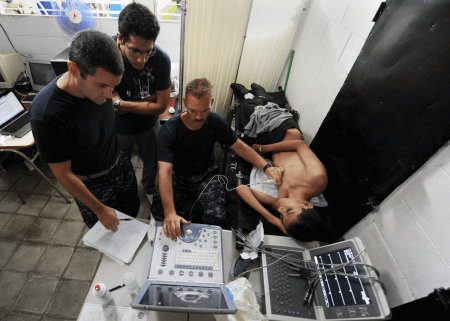 But what’s the difference between an echocardiogram (ECG) and an electrocardiogram (EKG)? 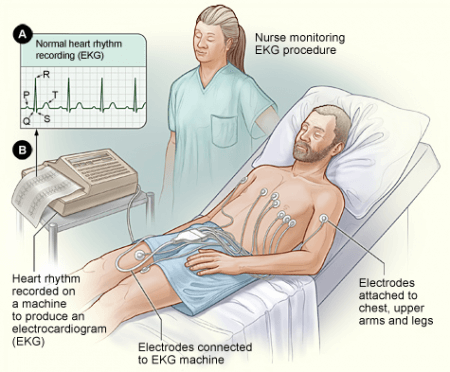 An electrocardiogram is a very common procedure done in the emergency room or bedside because it is affordable. An echocardiogram, on the other hand, is done when cardiac problem has been detected and the doctor wants to see further problems of the heart and to determine the severity. An echocardiogram detects structural and functional problems of the heart while an electrocardiogram detects electrical problems of the heart. An echocardiogram relies on ultrasound to flash the structure of the heart on the screen while an electrocardiogram depends on the electrical activity of the heart for it to be displayed on the tracing paper. As for the procedure, the patient is asked to lie on his side for an echocardiogram and on his back for an electrocardiogram. Gel is needed for an echocardiogram but not for an electrocardiogram. In an echocardiogram, a transducer is placed on the chest and in an electrocardiogram, leads are placed on the chest and limbs. A sonographer or ultrasound technologist performs the echocardiogram while an EKG technician conducts the electrocardiogram.